The Nobel Prize in Physiology or Medicine has rewarded scientists for an amazing voyage of discovery inside the human nervous system - one that has revealed how the myriad tiny signals firing through nerve cells keeps us alive, thinking and moving. Estimates vary wildly, since of course, no-one has counted them all, but there are some 100 billion separate nerve cells in the human brain - which is, by strange coincidence, around the same number as there are thought to be galaxies in the Universe. But this number, however awesome, doesn't begin to capture the almost miraculous complexity of the human nervous system. Each of those 100 billion cells can make hundreds and hundreds of separate connections with other cells - and unimaginably more alternative pathways - that allow nerve signals to crackle, fizz and buzz along as they make us jump up or sit down, laugh and cry, love and hate, sing, shout, swear, eat, drink and do everything that makes us human. The nervous system consists of a complex, interwoven network of nerve cells that look like no other. 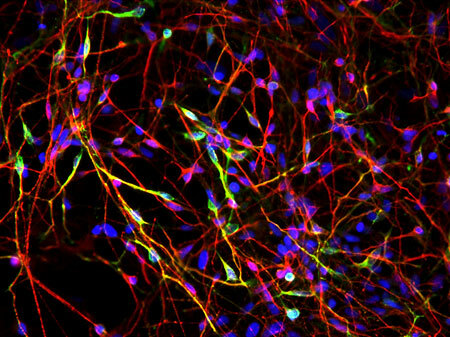 This fluorescent microscopic image of neurons generated from human embryonic stem cells highlights this complexity. Spider-like nerve cell bodies with thin thread-like axons are visible in red and the nuclei in blue. Yellow neurons create and release the neurotransmitter dopamine, and are the type of neurons that deteriorate in patients with Parkinson's disease. Copyright: Laboratory of Xianmin Zeng, the Buck Institute. One of the first of the great pioneers of nerve research to receive the Nobel Prize, a Spanish surgeon's son called Santiago Ramón y Cajal said, "The brain is a world consisting of a number of unexplored continents and great stretches of unknown territory." And towards the end of the 19th century that is how it must have appeared as the power of the microscope revealed just what a complex and amazing network the human nervous system is. We know now that the nervous system consists essentially of the command centre in the central nervous system - the dense cluster of nerve cells in the brain and spinal cord - and the signalling network of peripheral nerves - fibres that stretch out into every corner of the body. But nerves are incredibly fine. A nerve fibre can be less than a hundredth of the thickness of a human hair, so with the microscopes available in the 19th century, nerve fibres were very hard to see indeed. When they peered down a microscope, 19th century scientists could just about make out that the nervous system was made of what they took to be a network of nerve cells. But nerve cells looked like no others. Whereas most body cells are essentially parcels of some shape, nerve cells looked more like spiders with a bulky body off which spread countless thin threads, called 'processes'. They knew nerves played a part in signalling, so they guessed all these cell bodies and threads were fused together in one continuous network. But it was all so tangled and tiny that no-one could really see. Then in 1871, a young Italian anatomist named Camillo Golgi made a remarkable discovery in the hospital kitchen where he carried out his own experiments. Golgi found that if he soaked a bundle of nerve fibres over a few nights in silver nitrate - an idea some suggest he may have got from its use in photographic film - a few of the nerve cells stained a dark and inky black and showed up clearly under the microscope. Suddenly, complete nerve cells revealed their full appearance for the first time, and Golgi saw how the processes consisted of a single long tail or axon and an array of spindly branches or dendrites that spread out from the spider-like cell body. But he still thought they were all part of a tangled, inseparable web of fused fibres through which signals must flow this way and that. Working from a makeshift laboratory, Camillo Golgi developed a revolutionary silver staining method that allowed him to visualize individual nerve cells. 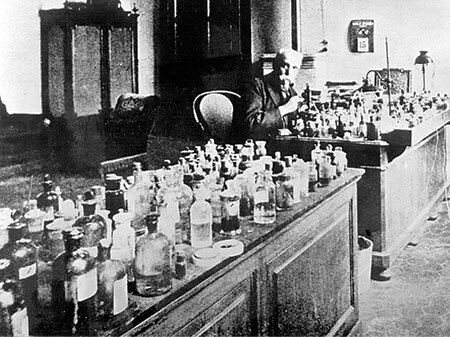 Golgi continued to develop staining techniques and teach about them; here he is seen at the age of 77 in his laboratory at the University of Pavia, Italy. The photo was kindly provided by Museo di Storia dell'Università di Pavia - Museum for the History of the University of Pavia. But then using Golgi's stain, Cajal, the Spanish surgeon's son, looked at the nerve cells of newborn birds and other small animals, which were simpler and easier to see than adult cells, and reproduced what he saw in a series of beautiful drawings. Cajal interpreted his observations differently to Golgi, proposing that there were gaps between the processes of each cell, and that each cell was actually a separate unit or neuron, not part of a fused network at all. Nerve signals, then, must be passed on from neuron to neuron across the gaps, later called 'synapses', in a kind of relay race. Then Cajal, who shared the Nobel Prize with Golgi in 1906, noticed that axons on neurons that connect to sense receptors such as vision, touch and hearing (sensory neurons) point in towards the central nervous system, while axons on neurons that trigger the muscles to move (motor neurons) lead away. Neurons, then, must carry signals in one direction only, taking messages in through the dendrites, and transmitting them through the axon. Using Camillo Golgi's silver staining method and blessed with natural artistic talent, Santiago Ramón y Cajal created stunning representations of different areas of the nervous system. 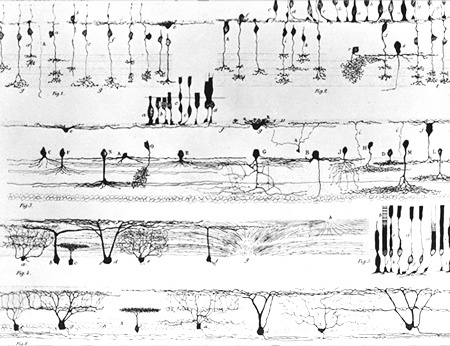 Here, Cajal's sketch of the retina shows clearly the variety of neurons present in the eye. Image kindly provided by the History of Medicine (IHM). Cajal began to realize that signals travel along particular pathways and that it might be possible to trace the paths through the nervous system from start to finish. It was a brilliant insight, which allowed scientists to explore how sense inputs from different parts of the body are wired into particular parts of the brain. By the middle of the last century neuroscientists such as American Wade Marshall, who trained the Nobel Laureate Eric Kandel, had shown how sense inputs from different parts of the body are wired into particular parts of the brain - a discovery summed up in a weird picture of a person called a 'sensory homunculus' which depicts areas of the body in proportion to how much brain space is needed to process the sense inputs. What was puzzling, though, was just how it all got wired up in the first place. Experiments in the 1950s showed that every neuron somehow knew how to reach its intended destination. Scientists such as Roger Sperry, who received the Nobel Prize in 1981, tried 'rewiring' nerves in experimental animals with bizarre results - connecting nerves back to front made the animals see upside down, or walk backwards. So how then did nerves end up attaching to the right place? Sperry suggested they were like hounds on a scent, drawn by a recipe of chemical signals sent out by the target. Few scientists believed this to be the case, even when Rita Levi-Montalcini discovered a chemical called Nerve Growth Factor, or NGF for short, that seemed to fit the bill. Together with her colleague, Stanley Cohen, Levi-Montalcini eventually proved that the NGF protein stimulates the growth of nerve connections, for which they shared the 1986 Physiology or Medicine Prize. Nerve fibres grow towards the source of NGF, which can be produced in the local neighbourhood by many types of cell, allowing fibres to find their intended destinations, even through the dense thicket of nerves that make up the brain. Thanks to the pioneering work carried out by Golgi and Cajal, Sperry, Cohen and Levi-Montalcini, and a host of other researchers, we have a remarkably clear picture now of how the nervous system is wired up. But finding out just how messages travel through it required another remarkable voyage of discovery. One of the big breakthroughs came from Charles Scott Sherrington, the man who in 1897 gave the synapse its name. Sherrington revealed how the nerve system coordinates movement. Scientists were already familiar with simple reflexes, such as the knee jerk, in which a tap on the knee makes the leg jerk up automatically and uncontrollably long before the brain knows what's going on. Sherrington's genius was to realize that nerve impulses are coordinated to create muscle movements in such reflexes, and that this is part of the integrated way that nerves control the body. Sherrington's work fed directly into that of Edgar Adrian, the scientist he shared the 1932 Nobel Prize with, and also that of Herbert Gasser and Joseph Erlanger, who received the Physiology or Medicine Prize in 1944. By the 1920s, scientists felt sure that nerve signals were electrical, and that nerves behaved like wires. Indeed, back in 1859, the ingenious German physicist Hermann van Helmholtz had actually managed to time the speed that electricity buzzes down an axon. Yet electricity in nerves seemed strangely slow, crawling along only at 90 feet per second - while electricity in a wire travels millions of times faster at close to the speed of light (186,000 miles per second). In fact, electricity in a nerve is not like an electric current at all. An electric current is a rapid flow of electrons, but electricity sweeps along the nerve as an 'action potential', a difference in electrical charge between the inside of the nerve and the outside. Amazingly, Adrian, Gasser and Erlanger found ways to connect wires to nerves and amplify the signal so that they could make an action potential fire off a sound in a loudspeaker, or create a light trace on the screen of an 'oscilloscope'. Adrian, as he listened to his loudspeaker, found that nerve signals are very simple, just going: bang! on, then bang! off. And to his surprise, a stronger stimulus increased only the number of nerve impulses that are produced every second, not the actual size of the impulse. Watching on their oscilloscope, Gasser and Erlanger detected that impulses had slightly different patterns in three kinds of nerve fibre, with both touch and muscle movement signalled rapidly through thick fibres and pain signalled more slowly through thinner fibres. It began to become clear that nerve signals are very simple; it is the way nerves are wired up that determines the message, not the nature of the signal. 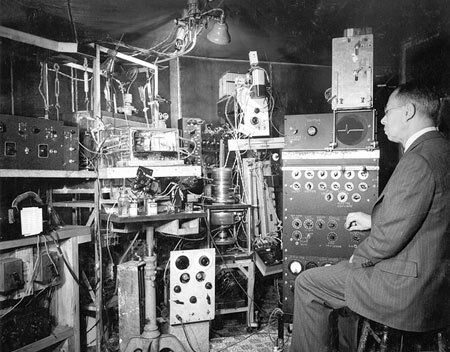 Joseph Erlanger sitting at the oscilloscope device that he and Herbert Glasser built to amplify and visualize nerve impulses, or action potentials, as they travel along a neuron. Using their device, Erlanger and Glasser discovered that different types of nerve fibres conduct impulses at different rates, which relates to their particular function. Courtesy of the Bernard Becker Medical Library. It was Adrian's student Alan Hodgkin who along with Andrew Huxley formulated a theory - termed the 'ionic hypothesis' - to explain how action potentials are generated. Most nerve fibres are so small and fine it is almost impossible to make any measurements inside, but Hodgkin and Huxley hit upon the great idea of experimenting with giant axons in squids. At a whopping millimetre thick, a squid giant axon is about a thousand times as thick as most human axons. Connecting wires inside and out of the squid axon, Hodgkin and Huxley measured the difference in voltage, in other words the action potential, as a nerve impulse sweeps along the axon. Using clever mathematical models to make sense of the mass of electrical data they collected, Hodgkin and Huxley revealed that in its 'resting' state, some negatively charged potassium ions seep in through the membrane that makes up the nerve cell walls, while positively charged sodium ions leak out, which creates a small but measurable voltage. When a nerve is stimulated, however, Hodgkin and Huxley proposed that 'ion gates' open up in the membrane, allowing sodium ions to flood in to create the upstroke of the nerve signal's spike, and potassium ions to flood out to create the downstroke. The action potential sweeps along the nerve as ion gates open and close in quick succession. In the 1970s, Erwin Neher and Bert Sakmann revolutionized the field with the development of the patch-clamp technique, an instrument that enabled scientists to study the flow of ions through a single one of these ion gates, or channels - a remarkable achievement for which they received the Physiology or Medicine Prize in 1991. And in 2003, Roderick MacKinnon received a Nobel Prize in Chemistry for his astonishing 3D pictures of ion channels. Ion channels and nerve impulses. Nerve impulses are generated by charged atoms, or ions, flowing into and out of nerve cells through channels that line the cell membrane. 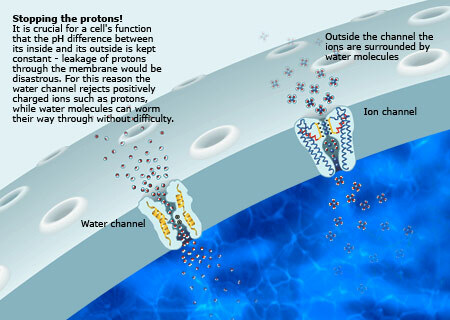 Sodium ions flowing in these ion channels create the rising phase of the nerve signal, while the falling phase is created by potassium ions flowing out. The wave of electric charge moves along the nerve cell as ion channels open and close in quick succession. Copyright: The Royal Swedish Academy of Sciences. 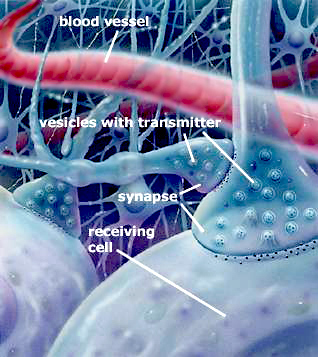 So we have a pretty good picture of how the nervous system fits together and how nerves transmit signals. But there's a third key part of the jigsaw: how signals cross synapses. Back in the 1930s, scientists were divided into two camps: On one side were the 'sparkers' who thought it was electrical, like the nerve impulse itself; on the other side were the 'soupers' who thought the synaptic signal was chemical. Sparkers just couldn't see how chemicals could move fast enough; soupers couldn't see how electricity would work. The soup idea gained strength in the 1930s through the work of British pharmacologist Henry Dale and German Austrian Otto Loewi, for which they received the Physiology or Medicine Prize in 1936. Loewi's ingenious idea was to collect fluid from around a frog's heart just after the connecting nerve had been stimulated to slow the heart down. He injected the fluid into another frog's heart - and immediately the second frog's heart slowed. No nerve signal had fired - so it was clear some chemical in the fluid was slowing the heart. Dale went on to show that the heart-slowing chemical is acetylcholine. There's also a heart-booster called adrenaline. 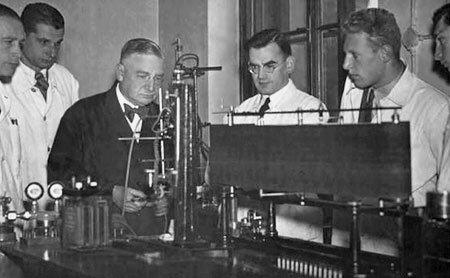 Otto Loewi with his assistants in his laboratory. Loewi’s ingenious experiment on frog hearts provided the first conclusive proof that chemicals transmit impulses from one nerve cell to another, and from nerve cells to their target organ or gland. Every effort has been made by the publisher to credit organizations and individuals with regard to the supply of photographs. The publishers apologize for any omissions which will be corrected in future editions. The sparkers, too, gained some ammunition, when scientists such as John Eccles discovered that in addition to the big action potentials that zip down the axon as the nerve sends its signals, there is a slower, smaller one made by incoming signals called a synaptic potential. Eccles realized that these synaptic potentials are the key to Sherrington's 'integrative action'. The nerve cell is bombarded all the time by waves of synaptic potentials through its dendrites - some excitors, some inhibitors. When excitors outbuzz inhibitors, an action potential fires off along the axon. But just how do signals cross the synapse? Eccles was fervently on the sparks side, Dale was a real souper, and they almost had a punch-up over it at one conference. But as the Second World War got under way, Eccles went to work in the safety of Australia with a Jewish refugee from Germany named Bernard Katz and an Austrian refugee named Stephen Kuffler. Having started on the sparky side, first Katz and Kuffler, and then Eccles flipped over to become soupers as the evidence mounted. Experiments were increasingly showing that signals are carried across synapses by chemical messengers called 'neurotransmitters', which are released at the axon tip. Katz showed that when molecules of acetylcholine, the first known transmitter, are released from a motor neuron, they spread rapidly - in fact almost instantly - across the synapse to muscle cells. There they bind to receptors, like a key slotting into the right lock, and as they slide home, they open gates in the cell membrane, letting charged ions flood in, and setting the synaptic potential on its way. These chemical molecule or 'ligand-triggered' ion gates are different from the 'voltage-triggered' ion gates that set off action potentials, allowing both sodium and potassium ions to flood through each way. Soon a whole range of neurotransmitters had been discovered, such as serotonin. Some are typically excitors, such as glutamate, while others are mainly inhibitory, such as GABA. But it is the receptor they bind to that excites or inhibits, not the transmitter itself. So while glutamate excites most nerves, there are some it inhibits. There was a twist to the soupers' victory tale, when in the late 1950s, two students of Katz, Edwin Furshpan and David Potter, found a few examples of electric signalling across synapses. But in the brain at least, synaptic signalling is mainly chemical. Katz, as well as Ulf von Euler and Julius Axelrod, went on to discover just how this process worked, for which they shared the 1970 Physiology or Medicine Prize. Katz found that transmitters are not released molecule by molecule but spill out in a flood from tiny packets of 5,000 or so molecules contained in vesicles, which fuse with the nerve cell wall and open into the synapse. Discovering another neurotransmitter, noradrenaline, von Euler established that this chemical is created in the nerve fibres themselves and stored in swellings concentrated at nerve endings. Axelrod revealed how unused noradrenaline is reabsorbed by nerve cells after the chemical message has been delivered. While this answered many fundamental questions about neurotransmitters, a key piece of information missing was what tasks these chemicals actually carry out when they reach their target nerve cells. Figure 7. How neurotransmitters work, part 1. Chemicals called neurotransmitters are responsible for transmitting nerve impulses across the synapse from one nerve cell to another, or from one nerve cell to a target organ or gland. When a nerve impulse reaches the synapse, neurotransmitters spill out from tiny packets of around 5,000 molecules contained in vesicles within the nerve terminal. The released neurotransmitters spread rapidly across the synapse and bind to chemical receptors on the surface membrane of a receiving nerve cell. In most cases unused neurotransmitter is reabsorbed by nerve cells after the chemical message has been passed on. Copyright: The Nobel Committee for Physiology or Medicine at Karolinska Institutet. Uncovering this information earned Arvid Carlsson, Paul Greengard and Eric Kandel the Physiology or Medicine Prize in 2000. Through their pioneering studies, the three scientists showed how neurotransmitters influence basic functions of the brain and how they are affected by disease. Carlsson's research into neurotransmitters revealed, for the first time, how a brain disorder actually worked. After discovering a transmitter called dopamine, he found that reducing levels of it in the brains of experimental animals created symptoms like Parkinson's disease, a so-called neurodegenerative disease that causes severe movement problems. From this Carlsson deduced that the disease is caused by a loss of dopamine in brain regions affecting control of movements, and that it should be possible to treat with the dopamine boosting drug L-DOPA, which has brought relief to millions of Parkinson's sufferers. Greengard showed how dopamine and other neurotransmitters trigger these types of effects in nerve cells. His studies built directly on the work of Earl Sutherland and Ed Krebs, who found in the 1960s that there are two types of receptor for neurotransmitters. When a transmitter locks onto and opens a ligand-gate (also known as an 'ionotropic receptor'), it sparks out a synaptic potential instantly, and it's all over in milliseconds. Sutherland and Krebs discovered another kind of receptor, called a metabotropic receptor, which produces a very different response that is much more widespread and can go on for minutes. Greengard painstakingly assembled a complete picture of the events that occur during these 'slow' synaptic signals. 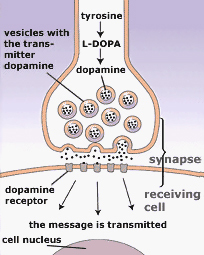 When dopamine locks on to a metabotropic receptor, it releases a so-called 'second messenger' inside the cell called cyclic AMP, which activates protein kinase A, a kind of master switch that can activate a host of biologically important proteins by adding phosphate molecules onto them. Greengard identified over one hundred of these activated chemicals, and found how they interact in elaborate cascades to alter the way the cell behaves and reacts. These discoveries are helping to build a detailed picture of how the neuron's biochemical software works. When dopamine and other neurotransmitters reach the receiving nerve cell they attach themselves to two types of receptors. One type of receptor sparks off a nerve impulse within milliseconds. Another type triggers a slower event, where messenger molecules set off an elaborate chain of chemical events, which eventually activates a host of biologically important proteins that alter the way the nerve cell behaves and reacts. Meanwhile, Kandel was showing just what it was all programmed to do - store memories. Kandel pioneered the idea that nerves remember things because of changes at synapses, and that learning is all about activating second-messenger cascades of the type studied by Greengard. Remembering things means, essentially, unleashing the right cascades of chemicals to reinforce the connections between neurons along particular pathways. It seems appropriate to finish our story here, with the beginnings of an understanding of how we learn things. The whole process of how nerves work and how we learn things turns out to be just as awesome and fantastic as we would expect such a mechanism to be. Whenever a new sensation comes into your brain, it sends a flurry of activity surging through a particular tangle or network of neurons. Each neuron involved not only passes on its message to other neurons, but sends a signal back to the neurons that alerted it. This feedback loop might amplify the signal, or dampen it down. After the initial signal has died down, the neurons involved reinforce their connections with one another, so that they are primed and ready to fire again much more readily if the same sensation comes in, like a well-trodden path through the brain. If the sensation is not repeated, the connections begin to weaken, as the path falls out of use.